Are you in the market for commercial office coffee machines? 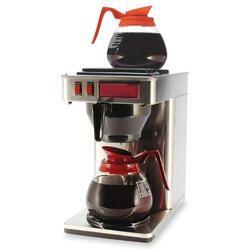 If so, look no further than Mountain Glacier for all of your coffee brewer needs. We offer several different machines, so you can choose the type that best matches your space and usage requirements. Our most popular options are our two- and three-burner brewers, which let you keep multiple pots of coffee warm at once, ensuring that there will always be enough coffee ready to drink throughout the day. You can rent one of these brewers for free with the monthly purchase of the office coffee supplies we also have available – the coffee grounds, cups, stirrers, and creamers that your staff will need to enjoy their coffee. As a Mountain Glacier customer, you can place or change an order in the manner that’s most convenient for you – call our customer care center or log on to our user-friendly website to order the coffee supplies you need. It’s that simple. In addition to offering convenient ordering options, we guarantee on-time, consistent deliveries, ensuring that your office will receive an uninterrupted supply of our delicious coffee and related products. For more information about the office coffee machines that we provide for businesses large and small, or to learn more about our office coffee service, contact Mountain Glacier today. We look forward to discussing how we can meet the needs of your business.